If you’re looking for some fun turkey crafts to make, you’ve hit the jackpot! 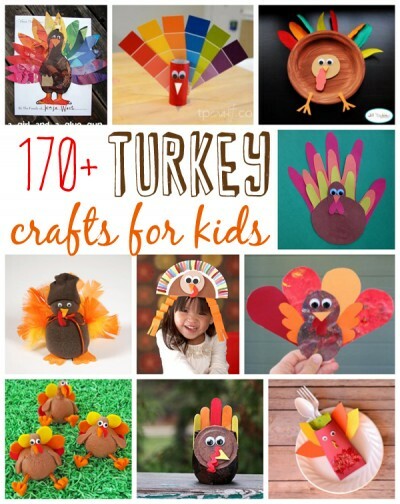 We’ve collected over 170 turkey crafts for toddlers, preschoolers and older kids too! We’ve selected ten of our favorites below, but you can find all 170+ turkey crafts right here. If you’re looking for fun turkey crafts for kids, you’ve come to the right place. You will find turkeys made from recycled items, jars, construction paper, paint, food, socks, and more! Rainbow Turkey – This adorable turkey is made from magazine collages. Your kids will have a blast putting them together! Paint Chip Peacocks or Turkeys – Have you been saving your paint samples? Turkey crafts are a great way to recycle them. Paper Plate Turkeys – This adorable turkey made from paper plates would be a fun activity for kids while dinner is cooking. Family Handprint Turkey – This unique turkey is made from each family member’s handprints! Thanksgiving Sock Turkey – Turn an old sock into cute turkey crafts that could be given as hostess gifts. Paper Plate Turkey Hat – This darling hat makes a fun Thanksgiving project your kids can wear. Leaf Art Turkey Magnets – This project turns a fun art activity into a cute turkey magnet. Thanksgiving Turkey Treats – These edible turkey crafts are just darling and great on each dinner plate. Mason Jar Turkey – Use craft sticks and a mason jar to make this cute turkey. Turkey Utensil Holders – Turn a cardboard tube into a turkey that holds utensils for the kids’ table! Looking for more than just turkey crafts? If you would like to see all Thanksgiving related crafts and recipes, click here. You can find our pumpkin crafts and recipes right here. If candy corn craft and recipes are what you’re after, you’ll find those here. All of our fall crafts and recipes are here. We also have a bunch of pilgrim crafts and edibles here.